For many of us, life in the 21st century is like a nightmare from which we can't wake up. The world seems to have been turned inside out. Harmonious music is seldom heard anymore, while dissonant cacophony and primitive jungle beats dominate the airways. Attractive painting and sculpture is no longer created, while simplistic abstraction and shock-value vulgarity sell for millions of dollars. Western culture, the light of the world, and history's greatest civilizing force, is denounced by the crassest propaganda, while ideologies of petty resentment are in the ascendancy. The most attractive women in the world are judged "f**," while grotesquely emaciated models are called "beautiful." It is like living on another planet with incomprehensible, alien values, and the only thing that preserves one's sanity is the knowledge that this "modern world" is the madness of a single century, while for millennia beforehand the Earth was a much finer place, where beauty and truth held sway. Nevertheless, from time to time, even in the midst of modern lunacy, one finds traces of a better world--a world that could be, and should be. A healthier, more beautiful world than our own. Several seasons ago, we described one such glimpse of a better existence in a post called "Advertising in the Alternative Reality," about an ad from the 19th century that encouraged women to gain beauty through being full-figured. 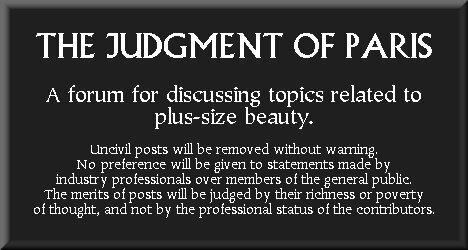 More recently, one of our forum members discovered a more complete presentation of a preferable reality in a foreign television commercial that depicted a world in which plus-size girls grace magazine coves and billboards, and receive limitless male attention, while underweight waifs are ignored. But now we have discovered, in the very recent past--as recent as the 1950s--a series of advertisements that show just how close society came to rediscovering true feminine beauty and righting itself, before the calamity of the 1960s (the most pernicious decade in history) destroyed what was left of traditional culture. Yes, you read that headline correctly. 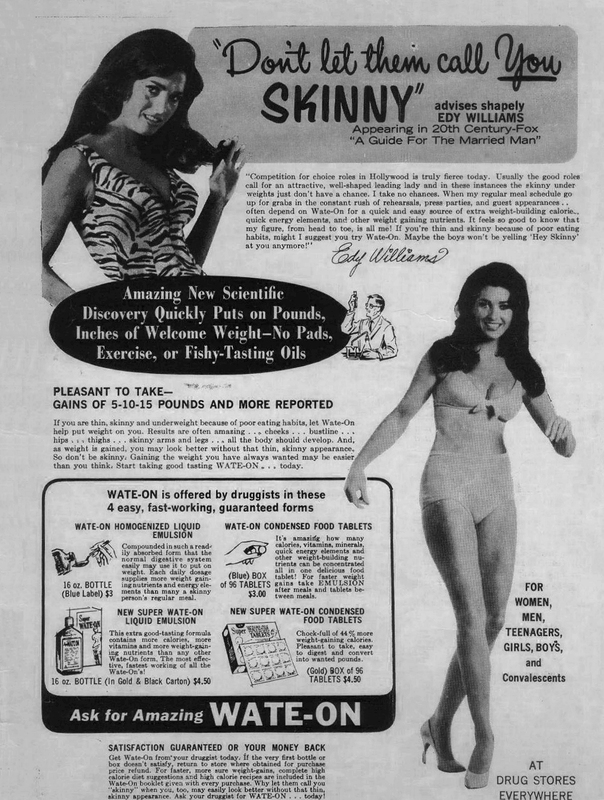 This ad is genuinely exhorting readers, "Don't Be Skinny"--acknowledging that to be "skinny" is something to be avoided. 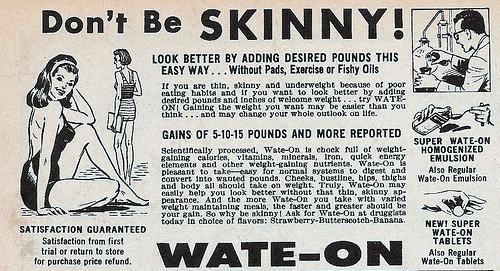 "Look better by adding desired pounds." 2. that weight gain improves a woman's looks. We all know these things to be true, but the modern media emphatically denies these facts, or pretends that the opposite is the case. Yet here is a mass-market commercial ad which identifies true feminine beauty, and how it can be attained. The accompanying graphic makes the point even more explicitly. 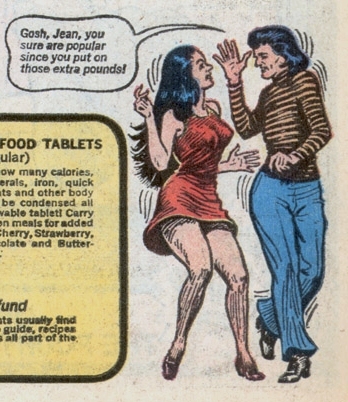 It resembles a before-and-after diet ad, except that in this case, the fleshier, more curvaceous vixen on the left looks young, happy, and attractive, while the scrawny straight-size woman on the right looks shrivelled and miserable. Even the cut line, "satisfaction guaranteed," has multiple meanings: First, the better-nourished girl enjoys the satisfaction of eating as much as she likes rather than starving herself, and second, her improved appearance yields more satisfaction in life (bestowing upon her the blessings that come with being more desirable). Another ad from the same company amplifies these points. 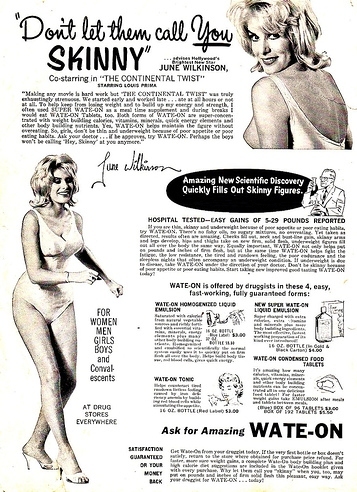 The copy enthuses that the product "fills out skinny figures," clearly indicating that doing so will constitute a physical improvement. It even itemizes which physical features will benefit from this weight gain: "Helps fill out cheeks, bust-line, arms, legs, and entire body." We have often noted that plus-size models--especially those who are going up in size--display increased beauty in every aspect of their person. Their faces are rich and full rather than drawn and sunken. Their busts are generous rather than flat. Their limbs are soft and round rather than stick-thin. The modern media never acknowledges these facts. Yet this ad does. "You sure are popular since you put on those extra pounds." 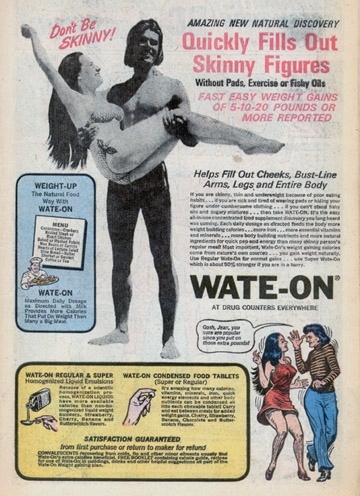 Imagine: the male suitor in the ad draws attention to the lady's weight gain, indicating that it is noticeable, yet enthusing that she has become more appealing (not just to him, but to all men--as the word "popular" implies) precisely because she has "put on those extra pounds." The lady is twice blessed: she has experienced the pleasure of eating generously, and, as a direct result, has become more attractive. "Put pounds and inches of welcome weight on skinny figures." The extra weight is literally "welcome." The visible results of sweet self-indulgence are presented as a cause for celebration. Yes, you read that correctly. 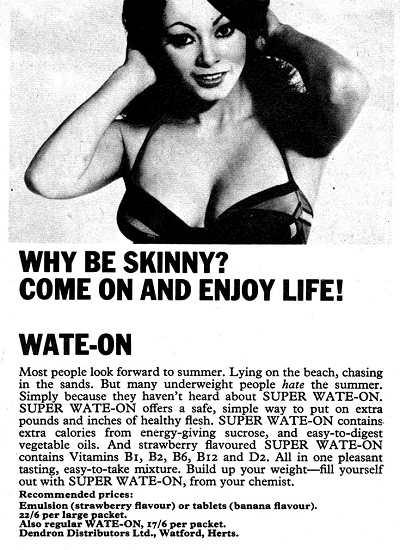 This ad affirms that being thin in an impediment to enjoying life, and that happiness comes from being full-figured. The ad acknowledges the joy that goddesses experience from indulging themselves freely, and asks why any woman would deprive herself of this pleasure, and therefore diminish her own satisfaction. "Most people look forward to summer. Lying on the beach, chasing in the sands. But many underweight people hate the summer . . . Build up your weight--fill yourself out." Could there be a more positive message? 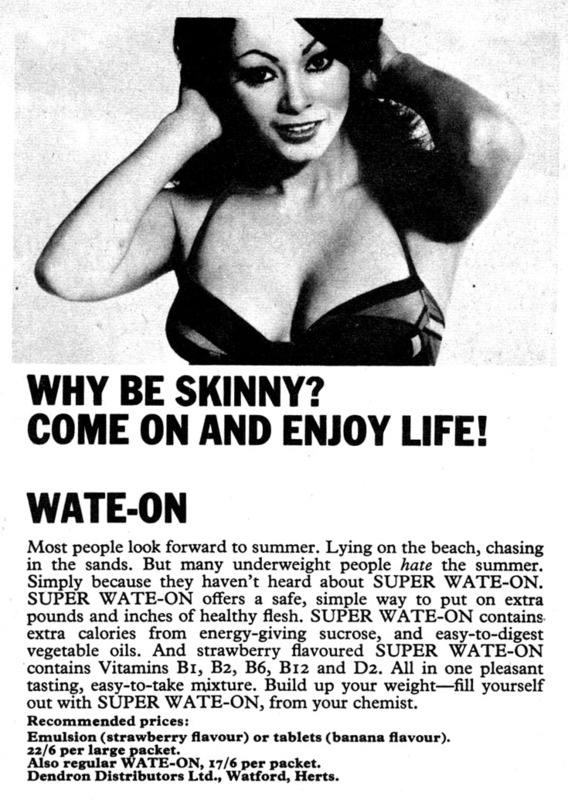 The ad reveals an unacknowledged truth--that in fact it is the skeletal models, with their sunken chests, caved-in waists, and hip-deprived stick-figure forms, who should feel embarrassed in swimwear. On the other hand, the more that a goddess "fills herself out," the more alluring her figure will be, and the better she will look in swim fashions. These ads even employ a well-known tactic of modern advertising--using celebrities to make their point. 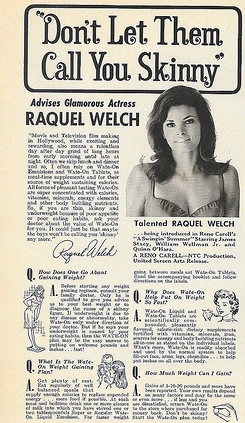 In the following promotion, the buxom Raquel Welch shows how attractive a well-fed lady can be. The final ad in this series, seen below, comes to us in a larger size; therefore, if you click on the image, you can read all of its promotional copy. "Competition for choice roles in Hollywood is truly fierce today. Usually the good roles call for an attractive, well-shaped leading lady and in these instances the skinny underweight just don't have a chance." Note that this ad invokes the Hollywood ideal, just as today's promotions do. However, here it is used as it should be--to demonstrate the superiority of a full-figured look. (Remember, the 1950s was the time of buxom goddesses such as Kim Novak and Anita Ekberg.) If Hollywood still idealized full-figured beauty today, it would be a force for good, not harm, and a source of positive body image--just as the fashion industry would be, if it used plus-size models instead of anorexic waifs. "If you're thin and skinny because of poor eating habits..."
The logic of this is inescapable. If a girl has "poor eating habits," i.e., if she eats poorly, she is naturally bound to be underweight, whereas is she is well-nourished and full-figured, her eating habits are, by definition, excellent. This the natural order of things, and it is a measure of how insane the modern world has become that the phrase "poor eating habits" has been twisted into a different meaning, due to diet/exercise-industry propaganda. "As the weight is gained, you will look better without that thin, skinny appearance." Not only does this indicate that a full-figured look is more attractive than a gaunt appearance, but specifically that weight gain--the pleasurable process by which a woman indulges herself and adds pounds to her figure--is what yields figure improvement. It goes on to describe the ease of this beauty-improvement process. "Gaining the weight you wanted may be easier than you think." The final quotation, above, brings us to the crucial point: Although these ads promote a long-forgotten pharmaceutical product, their commercial origin is irrelevant. Their underlying message, on the other hand, is lasting. Women can easily obtain all of the physical blessings of becoming fuller-figured (which the ads enumerate) simply through yielding to their natural cravings, to the appetitive impulses that nature gave them, in order to impel them to perfect their own beauty. Not only is the process simple (eat whatever you like, and as much as you like), but it is acutely pleasurable, as most women will attest. It is nature's ultimate win-win situation, the opportunity that every goddess has to enjoy the best of both worlds, to have her cake (feminine beauty) and eat it too (the enjoyable process by which that beauty is attained). These ads show the world as it should be, not the upside-down perversion of existence that modern Hollywood creates, in which voluptuous beauty is maligned, and sickly emaciation is called attractive. The statements in these ads, expressed in simple commercial copy, are in tune with human nature and timeless values, and all women should take them to heart. If society accepted these premises, then the world in which we live would be a healthier, more beautiful place. I LOVED seeing these ads. They're so inspiring. Close your eyes and imagine, just for a moment, what the world would be like- what a positive, uplifting, happy place it would be- if these were the ads that everybody saw all the time: on billboards, in magazines, on TV, everywhere. If this was what our media envionment looked like, the world really would be a better place. 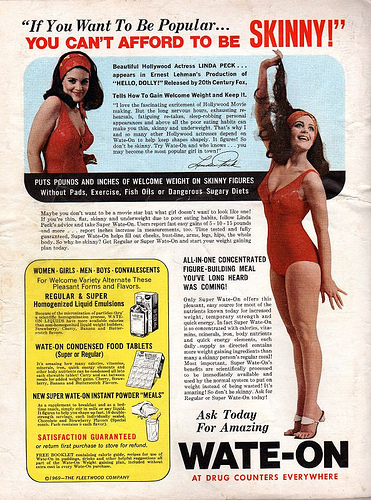 The only thing that would have made these '50s ads more perfect would have been if they had featured fuller-figured girls, or actresses who were just as curvy as our favourite plus-size models of today. I really wish the girls in the ads were bigger. But regardless, they deliver a terrific message. I wish all girls struggling with body image would print out these graphics and post them on their lockers, or in their rooms, anywhere where they could see them constantly, in order to counter the brainwashing that they otherwise get from today's media. Though I feel good about my body most of the time, it's been hard to hear some of the size-negative and self-hating things women say about being full-figured. I added some of these ads to my work computer's "My Pictures" folder, along with photos of beautiful plus-size models so that I can view them as a screensaver slideshow. My hope is that everyone else will see these images too, and think about whose rules they're following when they think they have to starve themselves to be beautiful. Despite my disappointment at how thin the models in these ads are (I wish the pictures featured plus-size models instead! ), this is one of my favourite posts from 2008. It really shows what a better world might look like, and how it would think about women and body image (i.e., in a much saner way than we do today). It doesn't surprise me that the 1950s were the lone decade in the 20th century when curvy figures almost made a comeback. Women were interested in being women again, after the deprivation of the war years. The suffragette movement was over, and feminism hadn't yet reared its ugly head. Society was, for a while, closer to a natural mode than it ever would be again. Incidentally, although they weren't truly full-figured, the most attractive actresses of the 1950s were quite shapely. Look at this Life magazine photo of the gorgeous Kim Novak. See how beautifully untoned her soft legs are. It's a truly feminine look, which you would never see in the media today (more's the pity). It really was a better world in the 1950s -- and in every century before the 20th -- aesthetically and culturally.